This ruling by the highest Court in the United Kingdom unequivocally recognizing Scientology’s religious bona fides means that English Scientologists are now able to legally solemnize their marriage before family and friends in a Scientology religious wedding ceremony celebrated at the London Church chapel. The Supreme Court ruling embraces the principles of equality and non-discrimination in matters of religion. The decision ensures that the Church of Scientology and Scientologists are treated no differently than other religions and their parishioners in the UK and are accorded the same rights. In finding that Scientology is a religion and that its chapel (which is found in every Church throughout the world) is a place of religious worship, the Supreme Court determined that the definition of religion and worship must be modern and expansive enough to encompass the faiths practiced by a majority of the population of the world. By way of background, the Supreme Court opinion overturned a 1970 Court of Appeal decision denying an application to certify the chapel at the Church of Scientology at Saint Hill, Sussex, as a place of religious worship. The Court of Appeal determined that the practice of Scientology was not “in accordance with the Places of Worship Registration Act of 1855,” as Scientologists did not worship a “personal creator God.” The Court of Appeal conceded that other recognized world religions such as Theravada Buddhism also did not worship a personal creator God, but that Buddhism was an exception to the rule. The opinion provided no explanation for this exception. The Registrar General continued to refuse recognition of Scientology Churches, based on that 1970 decision relied upon by other UK ministries for over four decades to justify discrimination against Scientologists. It was time to overturn this erroneous, outdated decision and present the picture of Scientology today, represented by the full panoply of religious services and community-betterment programs in Scientology Ideal Orgs. In 2011, Louisa Hodkin, a Scientologist who wanted to be married in her Church before her family and friends, filed a new application for registration of the chapel at the Church of Scientology of London as a place of religious worship. Once again, however, the Registrar Office denied the application, based on the 1970 decision and the 1855 statute. Ms. Hodkin then took her case to the courts. 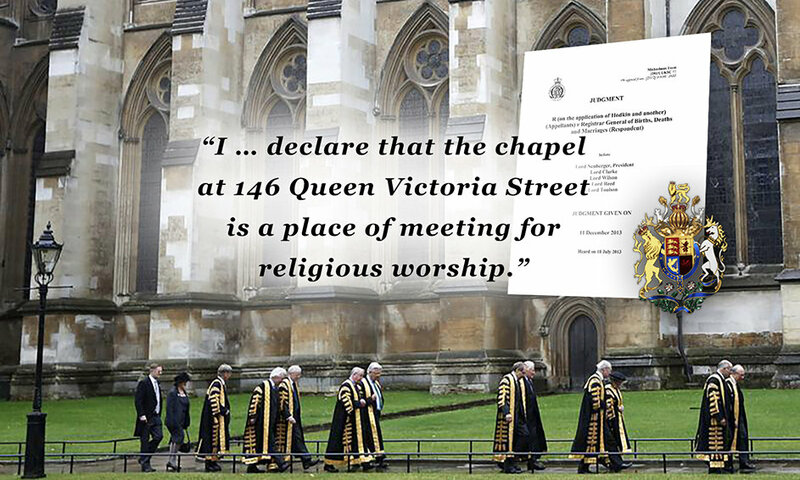 At the first-instance level, the Court determined that Scientology was indeed a religion; nevertheless, the Court noted that it could not certify the London chapel as a place of worship because it was bound by the Court of Appeal 1970 decision. It recognized the importance of the case and recommended that the appeal be heard directly by the Supreme Court. The Supreme Court readily accepted the case. In its decision the Court overturned the negative 1970 decision in full and interpreted the 1855 Act so that it reflected a proper and modern definition of religion that included Scientology, not one confined to narrow Judeo-Christian standards that prevailed in England when the 1855 Act was passed. Lord Toulson, writing for the Court, described the historic prohibition against Scientology as “illogical, discriminatory and unjust.” The other four Supreme Court justices, led by the president of the Supreme Court, Lord Neuberger, all agreed. Unless there is some compelling contextual reason for holding otherwise, religion should not be confined to religions which recognise a supreme deity. First and foremost, to do so would be a form of religious discrimination unacceptable in today’s society. It would exclude Buddhism, along with other faiths such as Jainism, Taoism, Theosophy and part of Hinduism. The evidence in the present case shows that, among others, Jains, Theosophists and Buddhists have registered places of worship in England. Lord Denning in Segerdal  2 QB 697, 707 acknowledged that Buddhist temples were “properly described as places of meeting for religious worship” but he referred to them as “exceptional cases” without offering any further explanation. The need to make an exception for Buddhism (which has also been applied to Jainism and Theosophy), and the absence of a satisfactory explanation for it, are powerful indications that there is something unsound in the supposed general rule. Further, to confine religion to a religion which involves belief in a “supreme deity” leads into difficult theological territory. On the evidence of Mrs. Wilks, Scientologists do believe in a supreme deity of a kind, but of an abstract and impersonal nature. Ideas about the nature of God are the stuff of theological debate. A spiritual or non-secular belief system, held by a group of adherents, which claims to explain mankind’s place in the universe and relationship with the infinite, and to teach its adherents how they are to live their lives in conformity with the spiritual understanding associated with the belief system. On the approach I have taken to the meaning of religion, the evidence is amply sufficient to show that Scientology is within it. In my view the meaning given to worship in [the 1970 decision] was unduly narrow, but even if it was not unduly narrow in 1970, it is unduly narrow now. The broader interpretation accords with the purpose of the statute in permitting members of a religious congregation, who have a meeting place where they perform their religious rites, to carry out religious ceremonies of marriage there. Their authorisation to do so should not depend on fine theological or liturgical niceties as to how precisely they see and express their relationship with the infinite (referred to by Scientologists as “God” in their creed and universal prayer). Those matters, which have been gone into in close detail in the evidence in this case, are more fitting for theologians than for the Registrar General or the courts. Based on these findings, the United Kingdom Supreme Court ruled that the London Church of Scientology chapel “is a place of meeting for religious worship within section 2 of the Places of Worship Registration Act.” The Supreme Court accordingly ordered that the Scientology chapel be registered as a place of worship and as a place for the solemnization of marriages. Thus Scientology gained full religious recognition in the United Kingdom. My fiancé and I have always believed in the fairness of the British legal process. It’s been a long and demanding journey, but the Supreme Court’s decision today has made it all worthwhile. We are really excited that we can now get married, and thank our family and friends for all of their patience and support. Subsequent to this historic ruling ending any legal basis for religious discrimination against Scientologists in the United Kingdom, Louisa Hodkin was happily married before her family, friends and fellow parishioners at the London chapel. Friends, family and supporters at the Church of Scientology of London. The historic December 2013 United Kingdom Supreme Court decision, coupled with the 1983 landmark ruling by Australia’s High Court recognizing Scientology as a religion (See 1983 Australian High Court Decision: Church of Scientology: Landmark Recognition of the Scientology Religion), represent the two premiere cases on the subject and definition of religion by the highest courts in the United Kingdom and Australia. As such, they form a clear and overwhelming precedent in Commonwealth countries and the English-speaking world. The Commonwealth of Nations—formerly the British Commonwealth—is a voluntary association of 53 independent sovereign States, most of which were once part of the British Empire.